Welcome to the second online addition of Dog Bytes and the first issue for us as new publishers. We want to thank Kelly for her many issues over the years and the hours and hours it took of putting those together. We’re hoping to give her a break from this responsibility as she leads the club as president, works on awards, and all the other things she does. Beginning with this issue, we hope to tap into the knowledge and experiences of some of our club members. Please check out the wonderful article on search and rescue written by Linda Coffel. We want to thank Linda for being willing to write this first article. We know we can’t replace the awesome job that Kelly has done, but we hope to do a good job for the club. It was 1995 when I entered my first Springer Spaniel (Maggie) in the National Springer Spaniel tracking test in California. After that I was hooked and wanted to do more. 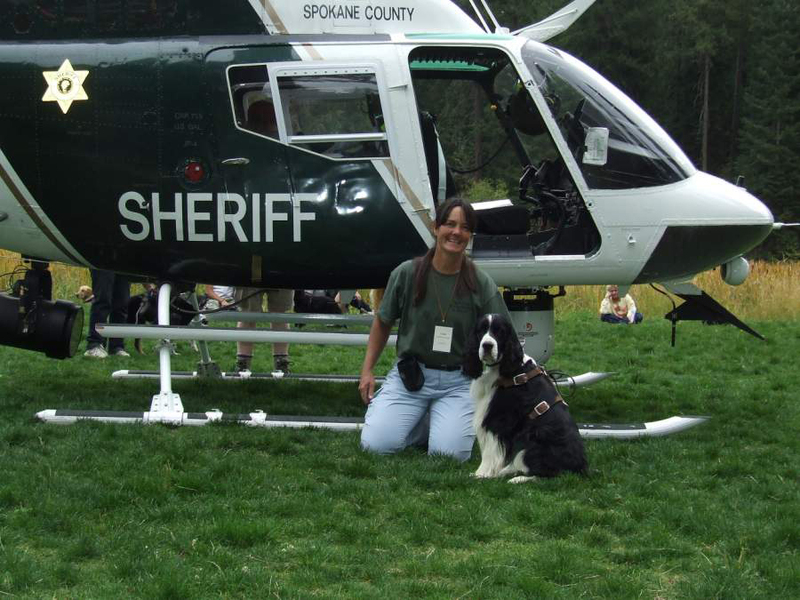 One day I received a call from a gal that was starting a group in our area for K-9 search and rescue. She needed help with trailing dogs and had heard I worked my dogs in tracking. That was my beginning in SAR. Most people think, “Oh my dog can do that.” More than likely they could, but they don’t realize the time commitment for themselves. In our county it can take 9 months for your basic search and rescue certificate if you make all the meetings and this is required before you can test your dog. In my first year I trained Maggie for trailing. The test would be 1 ½ miles long and 12 hours old. During training I noticed a slight limp that did not go away. By then I was addicted to SAR and began training Bandit. Bandit was not a trailing dog and would become my first airscent dog. In airscent the dog runs off lead and locates the person by following their scent on the air. Upon finding the person, Bandit had to return to me and give a trained alert. Bandit and I trained several times a week putting in long hours hiking cross country getting in shape for our test date in January, 1999. 160 acres, 4 hours and one person hidden from sight. Bandit had to make the find, I could not make a visual or the test would be void. At 3 hours 45 minutes one very tired dog (handler and tester) made the find. Bandit certified at 7 years old and search for another 4 years. In 2002 Echo was born. She would be my “Can do” dog. I loved trailing and airscent and so did she. The harness would come out of the truck and she would go nuts jumping and barking, not standing still long enough to get it on her. She would hit the trail eager to find the person and the food at the end of the trail. Her nose only coming up when she lost the trail and had to search for it. When her search vest was on she was in the airscent mode. Echo first passed her wilderness airscent test just south of Brothers Oregon. She caught the hiders scent from behind us and climbed the berm of dirt we had just passed. Running over the top and down the other side stomping on the hiders head as she went. Echo came running back and gave the trained alert, taking me back in for the find. Echo has several finds in her career, the best was finding a elderly person in the blackberry bushes one very cold January night. Quincey is my third SAR dog. I trained him in Airscent with the help of Echo, his dam, and he learned his job fairly quickly. One search we went on, I used Echo to find direction of travel and then I brought Quincey in to finish the search with airscent. Quincey located the person at the bottom of a creek bed. In 2013 Quincey certified in Human remains detection (HRD). 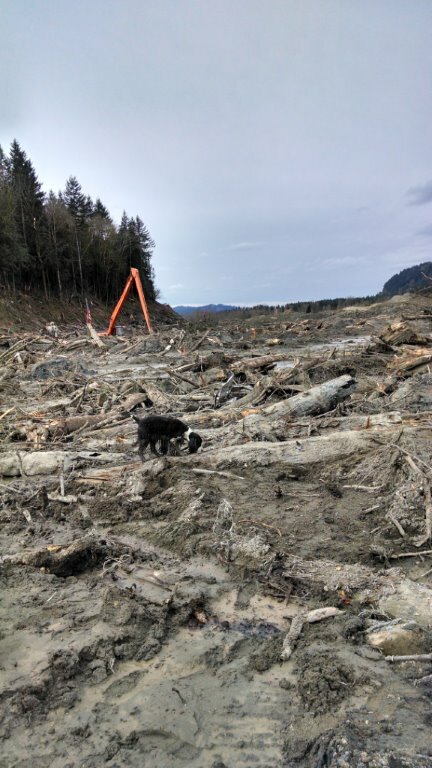 We were called to assist on a couple of local searches for missing persons.On March 29th we got a call wanting our assistance with the mudslide in Oso Washington. So on April 1 we headed north. Quincey and I helped to search the debris fields for two days. The dog teams were assigned areas, most of which had excavators working. Quincey had never worked around moving equipment. The Excavators would move debris and then the dogs would go into the section and search for remains. 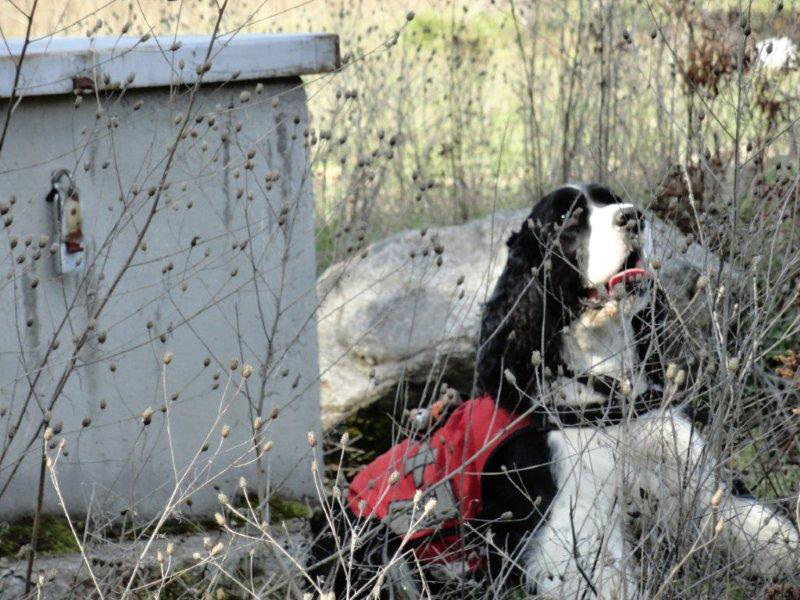 Most of the search dogs ran without collars or vest to avoid getting caught on objects. Each team worked about 4 hours a day. It was hard work trying to get around downed trees, mud, quicksand, and water. For Quincey, the look on his face when he sank up to his chest in mud. He learned quickly to slow down and watch where he was going. After searching we were both taken to the decontamination station and washed down. At camp, dog crates were provided with heaters to dry the dogs. I had shaved Quincey down and trimmed his feathers before I left home which helped in the drying. Being called to Oso was something we had trained for and gained valuable experience working with teams from around the country. Arriving back home the training continues with different problems to solve for Quincey. And the training of a teammates’ lab which will test this year. K-9 SAR for me is a way of giving back to my community. 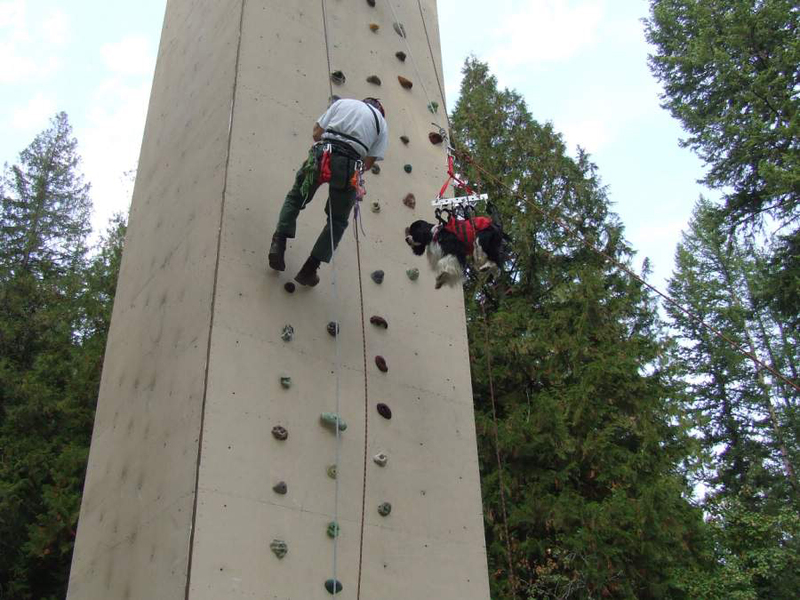 Training with the K-9’s, basic search training and working with mountain rescue, I wonder why I don’t have many free weekends. The difficult task of working at Oso. Editors note: Our canine companions are so much more than we realize. New scientific information is being gathered all the time about what they know and what they can communicate to us. They have heart, soul, desire, and dedication to help us when we don’t have the ability to do so ourselves. We are grateful to Linda, Echo, and Quincey and all other search and rescue partners who serve in this capacity, providing hope and closure to those who need it. The May Meeting will be held on Saturday, May 17th. 11:00 am at Elmer’s Restaurant, Parkrose. 10001 NE Sandy Blvd. next to the Pony Soldier Motel east of I-205. The banquet room is reserved. Please bring any raffle items to Debbie, Jeff, or Chris. The June Meeting will be held on Saturday, June 21st at Clackamas County Kennel Club. Time TBD. Jeff and Debbie Kirsch are going to be grandparents! Awesome article and photos by Linda Coffel. And thanks to Dave and Janee’ for taking on the newsletter. Carol C.
You’re off to a great start! Thank you for all the time you devote to the club!